Please note, the Minicom Classnet Twist Audio is discontinued. For replacement or upgrade options, please contact your KVM Switches Online sales representative at 1-877-586-6654. For those who demand the finest in interactive computer training, Minicom introduces a new deluxe model, the Classnet Twist Audio. This new Twist Audio features all the benefits of the Classnet Twist original, plus high quality stereo audio capabilities. The Twist Audio features advanced interactive computer classroom functionality. It allows instructors to take full control over any student computer to help student solve a problem; broadcast a teacher or student screen to demonstrate a concept; monitor and scan student screens, and gain students? undivided attention by darkening any or all of their screens. And like the Twist original, it features low density CAT5 cabling, which eliminates cable clutter and lengthens control to 300m/1000ft. 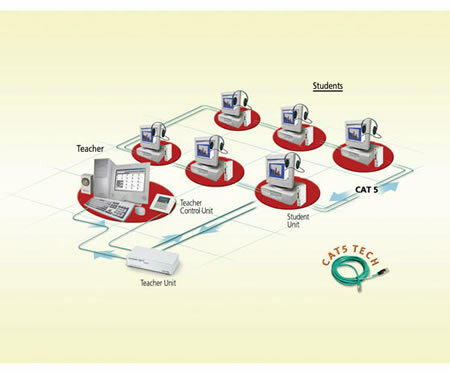 The audio feature lets teachers discreetly help individual students without disrupting the entire class; directly address the entire class without outside interference; broadcast audio presentations to the entire class, and transform their computer classroom into a complete multimedia center with the optional multimedia unit.